In this photo, students use a computer to explore the Spanish speaking countries of the world. In this learning log entry, I’d like to reflect upon facilitating and its close relationship with educational technology. Before taking a closer look at facilitation, let’s first examine the current definition of the field: the concept of educational technology, as defined by the Association for Educational Communications and Technology, is “the study and ethical practice of facilitating learning and improving performance by creating, using, and managing appropriate technological processes and resources” (Januszewski, A., & Molenda, M., 2008, p. 1). From this one definition, there are 13 elements that guide the day to day activities of an educational technologist, a teacher and a student. Although there are many components in this one definition, removing just one of these elements would drastically alter the experience of the learner! Removing any of the 13 elements would result in unique consequences (both predictable and unforeseen) and the removal of facilitating would surely imprint a lasting effect on the learner. As learning theories have shifted and evolved over time, so has the role of the learner. Educators have begun to stress the large role that learners hold in constructing knowledge (Januszewski, A., & Molenda, M., 2008, p. 4). We have found that students thrive in learning environments that are “more immersive and more authentic” and that students learn better from experiencing rather than just being told (Januszewski, A., & Molenda, M., 2008, p. 4). One of my earliest memories of using technology as a tool to learn occurred while learning about cities and architecture in middle school. Our instructor supplemented our studies with a simulation-based game called Sim City. In the game, we were given full control of the landscape, architecture, city and building planning, and natural disasters that occurred. No two student experiences with the game were identical and I quickly discovered valuable life lessons: it was important to budget my money as mayor of the city, to address areas that were crime-ridden and run down, and provide help to my citizens after a disaster. As Januszewski and Molenda discuss in their description of facilitation, I was given the tools to explore (supporting learning) instead of simply being presented the information and memorizing it (controlling learning) (2008, p. 4). Furthermore, facilitation should “assist learners in finding the answers to their questions” and this simulation provided the necessary tools (Januszewski, A., & Molenda, M., 2008, p. 4). If I was curious to see the impact of bringing a university to the town, the consequences of running a tornado through the downtown area or how citizens would react to increased taxes, all I had to do was use the options provided to try it out. In the roles of instructional designers, students, and in my own position as a trainer, we have just begun to understand the power of discovery-based learning. When I first accepted my position as a computer trainer, I pictured myself delivering teaching sessions that were focused on demonstration. First, I would talk with the student to learn more about their skill sets and goals. Second, I would then provide a step by step demonstration of how to accomplish the tasks necessary for their project. Finally, we would spend the remainder of the time practicing what the student had learned and answering any questions they may come across along the way. However, starting my training for the job, I learned that we would be using a different method of teaching that encourages the student to find the answer themselves. At first this seemed so topsy-turvy compared to my own experiences with computer classes. How could students teach themselves? What would prevent them from deleting things by accident? How would they know what tools to use? Nevertheless, it was surprising to find that this method of facilitative teaching was very successful! When I started presenting myself as a resource instead of an instructor, the students depended less on me and more on the array of tools available to them. Carl Rogers writes in his articles on humanistic education that “education will not be a preparation for living. It will be, in itself, an experience in living” and through providing a facilitative approach to technology and teaching we are doing just that! (Patterson, 1977, p. 42). Patterson, C. H. (1977). 5. Foundations for a theory of instruction and educational psychology (p. 42). New York: Harper & Row. 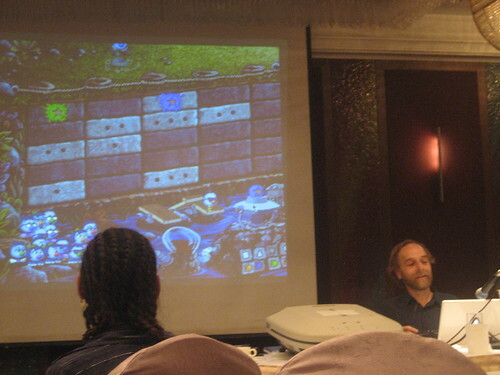 This picture shows a teacher demoing “Zoombinis” to his class. One of the first games that I remember playing in computer lab was “The Logical Journey of the Zoombinis.” The objective of the game was to guide “Zoombinis” (small creatures that look like a cross between a blueberry and a bean) on their journey to find a new home. First, I created a total of 16 zoombinis choosing a hair, eye, nose, and leg style and put them on a ship. After the boat landed, our adventure began! Using logic skills such as “set theory,” “trial and error” and “pattern finding,” I guided the adorable Zoombinis through fun lessons. I remember being fascinated with the level of interactivity the game provided-the game cheered and rewarded me when I was correct and made silly noises or threw my Zoombini in the air when I was incorrect. We were allowed to save our progress to the lab computers and each time I played my progress was reflected. Additionally, unlike the worksheets and spelling test I had each week, for the first time I had a lesson that was personalized to a difficulty level suited just for me! In this article, a home school teacher discusses how she uses Zoombinis to engage her kids. Here’s a very interesting article investigating whether Zoombinis will help to increase children’s critical thinking skills. To play the game yourself, it is still available to buy on Amazon.com. Welcome to My Edtech Blog!